More than two years after the Swedish Supreme Court of Migration decided there was no "inner armed conflict" in Iraq, and Sweden started the largest expulsion of any nationality that has ever taken place in the country, a Swedish Radio News investigation for SR's Ekot uncovers the grim truth about the new asylum policies in Sweden. Unique documents, a hidden microphone and a whistle blower reveal a new Swedish asylum policy of which most people are unaware. Sweden is known to be one of the most generous countries in the world in granting Iraqi asylum seekers refugee status. The government also pushes for all other EU Countries to adopt more generous policies when it comes to accepting particularly vulnerable Iraqi refugees, especially from the camps in the neighbouring countries of Iraq. At the same time SR News can reveal that Sweden at the same time has been returning other vulnerable Iraqis by force to Baghdad. During three days - starting on the 10th of August - SR News will reveal more evidence of the new Swedish asylum policy. For four months we have been interviewing 52 Iraqi citizens, all non-Muslim and most of them Christian Assyrians (also known as Chaldeans and Syriacs). These non-muslim minorities make up a large part of the Iraqi refugees in Sweden, maybe as much as 30-50 percent, although there are no official statistics. Some of the asylum seekers are now forced into hiding to avoid being sent back to Iraq, a country where only half the number of the Christians and other non-Muslims from before 2003 remain. Few non-Muslim Iraqis have been willing to return voluntarily. Many Christians are also afraid of the new tensions between the Kurdish provinces and the Baghdad government, and that a rising conflict between the two will put the large minority of Christians residing in the Nineveh Plains directly on the fault line. We have followed 25 Christian Assyrians who were forcibly returned to Iraq, 16 adults and 7 children. All but one are now on the run again from widespread persecution in Iraq. The Christians we are interviewing have ended up in varying difficult situations in 3 of the neighbouring countries of Iraq, trying to register as asylum seekers once again. They are now in the same countries where Sweden is choosing other vulnerable UN refugees to give protection to in Sweden. Jabil, a 30-year man hiding in Mosul, is the only one still left in Iraq -- without a passport or any means to get one issued in Baghdad. He says that he doesn't know how much longer he can hide. He says he is being chased by the same fundamentalist group who made death threats against him in 2007, forcing him to flee from Iraq. Now he is loosing hope of ever getting out of the country alive. "I have no relatives here, no one at all any more, that can help me." He says, "I rely on God and on you, that you can get some strength to be able to change things." Since 2007, Sweden has returned 3,800 Iraqi citizens; most of them have been refused asylum in Sweden. Between 10,000 and 15,000 Iraqis still in Sweden are expected to be returned, by force or voluntarily, over the coming years. From a total of 45,707 Iraqi asylum seekers fleeing to Sweden since 2003, to this date 20,757 actually have been granted asylum. Many of the persons being expelled have been living for years in Sweden, waiting for the final decision on their asylum applications. Their children have gone to Swedish schools, and many of the persons we have been interviewing are now shocked by the change in the country's migration policy. Ameera, one of the women who was forcibly returned in handcuffs back to the country she once fled from four years ago, says that she was separated from her children in a plane full of other terrified rejected asylum seekers. The plane landed in Baghdad in February 2009. "I still love Sweden and the Swedes," she says, "but I will never in my heart forget what those persons did to me, pushing us by force out of the country. It was like a horrible nightmare; were they really Swedes?" She and her family have since managed to flee to Turkey where they are now waiting to become registered as asylum seekers at the UNHCR in Ankara. Their case will be reviewed in late August. "I live with a friend and cannot leave the house, it's very dangerous here. I am threatened, in fear of being killed. Honestly, I cannot go out, if I do I'll be killed." Jabil fled from his home town Mosul in March 2007 after he was threatened by militant Islamists. We have followed him since he was arrested by the Swedish police in the north Swedish city of Sundsvall on February 6th of this year and was subsequently forcibly expelled to Baghdad. "We arrived at the airport and the Swedish policemen handed my papers to Iraqi immigration and then left in a hurry. I told the Iraqi officer that I was being returned against my will, that I was terrified since I was Christian and came from Mosul. He said, condescendingly, that he couldn't care less." Ekot has followed 25 Christian Assyrians, also called Syriacs and Chaldeans. All of them except Jabil have fled to neighbouring countries: Samir to Jordan, Majed to Syria and Ameera and her family to Turkey. We met Ameera and Kameran Younán and their four children in Istanbul. The first time they escaped was to Sweden in 2005 and resided in Jönköping for four years before they were thrown out. Now they are waiting to register themselves as refugees with the UN. "We are tired and totally exhausted! Since that day when we were sent away from Sweden we've lived in misery. I see no change for the better. I loved Sweden and the Swedes but I will never forget how inhumanely we were treated by those who threw us out. It was like a nightmare. Were they really Swedes?" The security situation in Iraq has vacillated since the USA-led invasion of 2003. This year, on the average, ten civilians are violently killed every day, which makes it one of the world's deadliest conflicts in one of the world's most brutal countries. It has been well documented that Christian and other religious minorities are vulnerable to systematic persecution. 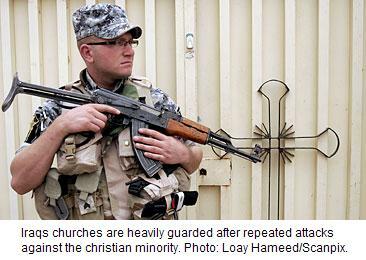 The population of Christians in Iraq has been halved since 2003. After a local threat in Mosul in October of last year that all the Christians would be killed; around 1500 families immediately fled the city. A Christian 'crystal night'! On the 12th of June this year six churches were attacked in Baghdad and one in Mosul during a single day. Four persons were killed and, at least, fifteen were injured. According to the Assyrian International News Agency, 59 churches were violently attacked or bombed since the outbreak of the war. Despite the well documented systematic violence against non-Muslims in Iraq, the news stories of sectarian persecution that appear almost every day in the Swedish press, the Swedish authorities appear to wear blinders as to what is happening in the Middle East and continue expelling Christian Iraqis back to the country of their murderers. 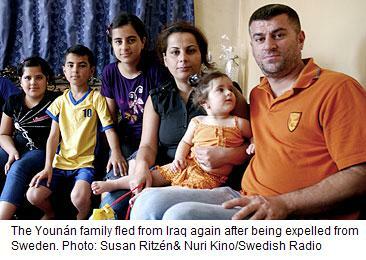 Ekot has followed 25 Christian Assyrians who have been expelled to Baghdad. All of whom have fled from Iraq once again. "MRG feel that it is not safe for non-Muslim minorities to be expelled to Iraq since they are exposed to directed violence on the basis of their religion. This includes Yezidis, Shabaks, Mandaeans and Christians. "That to be a Christian is enough to be persecuted in Iraq." She and other experts go as far as to call this "religious cleansing." "What we will see by the end, when the dust has fallen, that the number of Christians and Mandaeans, the non-Muslims who have remained in Iraq will become numerically negligible. In all practicality there will be no one left." On Jabil's rejection document from the Swedish Migration Board it stands that he hasn't proved that there is a real and foreseeable risk that he shall be personally exposed to serious acts of violence upon his return. But in Mosul his situation is getting continuously more desperate. He doesn't even dare to travel to Baghdad to get a new passport. "I have no family, no one who can help me. I trust in God and in you and that you will be given the power to change things."